On days like today—lazy, quiet, empty days that settle like dust in corners—I can’t help but think of my teachers. “Spread wide and dive deep,” a male student said in a lewd stage whisper. He was right. There were many empty days when I first went into business, days when I had nothing but myself and the world around me to investigate—so that’s what I did. As if it were no small thing. At first, I stood at my casement windows and fixed my gaze towards Chao’s Restaurant across the street; watching the customers come and go, watching the passers-by pass by. It was too much. So I turned around and looked at my own office. I investigated everything that came to mind; every inch of the room around me. At least that’s how it felt at the time, though I’ve come to see how superficial those investigations actually were. Still, when my first client finally showed up—a middle-aged man trying to remember a pun he had thought of the previous day and then forgotten—I found that I already had some leads. So, on empty days like this one, I chart the terra cognita of my office. I do this to prepare and to combat boredom—not only in the moment, but generally. If you see life and the world around you as a mystery, boredom is impossible. The flat, static, familiar objects you believe you already know become clues leading infinitely outward. For a long time I worked with lists. I picked a spot in the office that felt unfamiliar and stood there, clipboard in hand, while I wrote out an inventory of every item in my office. I reflected on each item, considering where it came from, how long I had owned it, what purpose it served, until I became intrigued by some idea or question. Then I tried to follow that idea or question wherever it might lead, for as long as possible. It was rare for me to work through the entire inventory. Usually I became engrossed by a particular item. On one memorable occasion I got no further than my clipboard. Regardless, the process was time-consuming and resulted in some expensive phone bills and convoluted browser histories. But it worked: my metal filing cabinet lead me to the life of Sir Francis Bacon; my aspidistra directed me to a history of Japanese Bento boxes; the glass ashtray I keep as a decoration (smoking has never been allowed in my building) resulted in my reading a biography of Anton Chekhov; the armrests on my couch took me to the Levant States and the history of French Colonialism, while the upholstery pointed me to special effects in theatre. And, over the years, those same items have taken me in dozens of other directions. Gradually, my interest shifted, became less literal. The inventory became an annotated list. Then I annotated my annotations. The objects were forgotten in favor of the list itself. Word-by-word, I consulted my reference books, noting each definition and listing synonyms. Using an X-Acto blade like a scalpel, I extracted each word, then sat at my desk and rearranged the cut-out slivers into poems and horoscopes. I made enlargements of each word so I could cut out individual letters to make new words; I made anagrams and palindromes. It wasn’t long before working with text began to feel too abstract and I shifted my focus back to objects. With the graphite pencils I had left over from my art course at the Academy, I made small line drawings on index cards of each object in my office. One day I laid these sketches side by side on my desk and stepped back to look at them. Laid out at random they looked like puzzle pieces and when I began to rearrange the cards to reflect the layout of the room, I saw that I had the beginnings of a map. 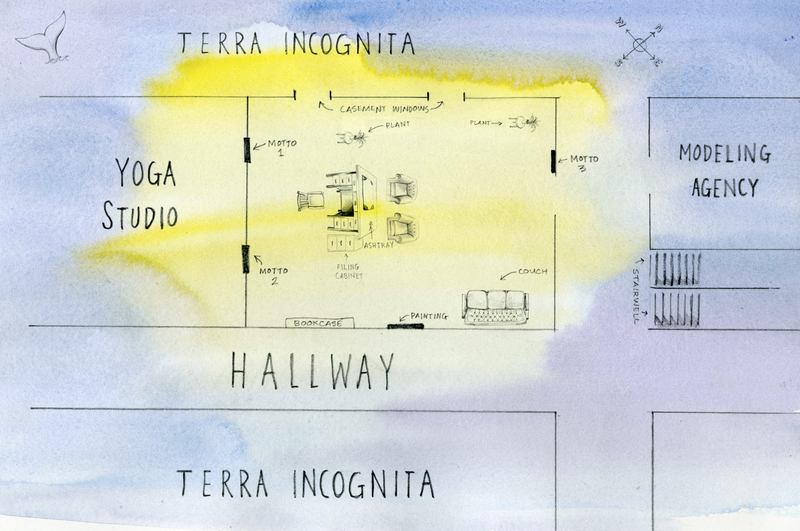 So now, on empty days, I draw maps of my office and annotate them. The maps have evolved—are evolving. The first maps were little more than floor plans with lists attached. As I’ve slowly taught myself to draw and paint, what began as an attempt to itemize a room and its contents has become an investigation in itself. With each map, I explore both the contents of the room and my experience of it. With pencil and ink I record the facts of the room and with brush and color I try to capture some of its essence. is everywhere; but still the truth remains, that mouth and purse must be filled. Acknowledgements: For making Nadie’s map a reality, my sincere thanks to Acey Toothypegs, beloved sister and dearest friend. Lovely as it is, this map only hints at her creative talents. Take a moment to explore Acey’s work at www.toothypegsart.com. His first words. Even before he introduced himself. Not that an introduction was necessary. I already knew his name — we all did. He was a legend. This was my first time seeing him up close. His figure was slight but he didn’t seem small. He seemed economical: absent any extraneous details. His pants were perfectly cut; pressed without looking too crisp. His cream colored shirt looked so comfortable I wanted to wear it. His shoes were worn but clean and well-maintained. I tilted an open hand toward the two chairs in front of my desk, a vague gesture that seemed to imply he was welcome to sit in both chairs simultaneously. He took a step forward but didn’t sit down right away. Instead he stood between the chairs, the fingers of his left hand grazing padded upholstery. He waited, his body not so much still as it was neutral, like a car: engine running, gears disengaged. “Thank you,” he said. Then his body flowed into motion, stepping between the chairs, then easing himself into the chair on the right. Standing still he had seemed light on his feet but in motion he was so graceful that his movements nearly escaped notice. “How can I help you?” I asked, sitting back in my chair. “I’m working on the wrong case,” he said. I resisted the urge to nod. Most clients need to feel that I understand their problem right away and a quick nod, even if it is a little premature, can help. This situation called for something different. He was a veteran detective. I had studied several of his cases, attended his lectures. No professional tricks: that was the best way to proceed. I opened my mouth to ask what he meant but he stopped me by raising a finger. Now I nodded. This was a situation I could understand. “Do you know why I became a detective?” He asked. I shook my head and said nothing. I make it a rule to never answer rhetorical questions. I raised my eyebrows. Many detectives leave the profession because they find it too depressing. We spend most of our time in the double darkness of our clients’ uncertainty and our own. Guiding people through the mysteries in their lives can be disheartening. I had never heard a detective cite sadness as their reason for joining the profession. No wonder he was such a natural. I nodded, noting the melancholy his words had triggered in me. Sadness was the core, the marrow, of life. How any times had I been on the verge of having this same, lovely realization? “And how do you find it?” I asked. The question seemed to surprise him and he smiled. He lowered his eyes for a moment. I agreed to take his case. We spent fifteen or twenty minutes discussing terms. He wanted to waive the customary rate reduction within the trade but I was unwilling to charge my full rate to a colleague. After some pleasant back and forth we agreed that I would receive part of my payment in future referrals. I expected him to leave after we had signed the contracts but once he had returned my pen and clipboard he settled back into his chair. “Tell it to me,” he said, gently. I took a deep breath and then began.